Jon R. Parquette received a B.S degree in chemistry from the University of California, Berkeley in 1988, and his Ph.D. in 1994 from Stanford University working with Barry M. Trost. At Stanford, he was an American Chemical Society, Division of Organic Chemistry Fellow. 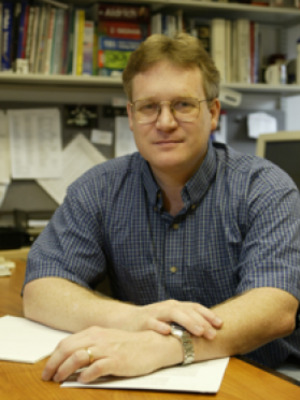 After completing postdoctoral work at Caltech in 1996, working with Peter Dervan as an American Cancer Society Postdoctoral Fellow, he became a faculty member at The Ohio State University. His research is currently supported by a National Science Foundation CAREER AWARD (1999). Asymmetric Catalysis via Dynamically Chiral Ligands. Self-Assembly of Nanostructures for Optoelectronics. Supramolecular Strategies for Treatment and Imaging of Cancer. Shao, H.; Gau, M.; Kim, S.; Jaroniec, C.P. :Parquette, J.R. Chem. Eur. J. 2011, in press. Shao, H.; Parquette, J.R. “A π-conjugatedHydrogel based on an Fmoc-Dipeptide Naphthalene Diimide Semiconductor, Chem.Commun. 2010, 46, 4285–4287. Wu, B.; Parquette, J.R.;RajanBabu, “Regiodivergent Ring-Opening of ChiralAziridines” Science 2009, 26, 1662. Shao, H.; Nguyen,T. ; Romano, N.C.; Modarelli, D. A.; Parquette, J.R.“Self-Assembly of 1-D n-TypeNanostructures based on Naphthalene Diimide-appended Dipeptides” J. Am. Chem. Soc. 2009, 131,16374-16375. Mitsui Mitsui, K.; Hyatt, S.A.; Turner, D. A.; Hadad, C. M.; Parquette, J. R., "Direct aldol reactionscatalyzed by intramolecularly folded prolinamide dendrons: Dendrimer effects onstereoselectivity," Chem. Commun. 2009, 3261-3263. Mitsui, K.; Parquette, J. R.,"Dendritic amplification of stereoselectivity of a prolinamide-catalyzeddirect aldol reaction," Isr. J. Chem. 2009, 49, 119-127. Shao, H.; Parquette, J. R.,"Controllable peptide-dendron self-assembly: interconversion of nanotubesand fibrillar nanostructures," Angew. Chem., Int. Ed. 2009, 48, 2525-2528. Yisgedu, T.B. ; Chen, X.; ScottSchricker, S.; Parquette, J. R.; EdwardA. Myers, E.A. ; Shore, S.G. “Synthesis and Characterization of Homopolymers andCopolymers Containing Closo-[B12H12] Boron Cage Derivatives.” Chem. Eur. J. 2009, 2190-2199. Wu, B.; Gallucci, J. C.;Parquette, J. R.; Rajanbabu, T. V., "Enantioselective desymmetrization ofmeso-aziridines with TMSN3 or TMSCN catalyzed by discrete yttriumcomplexes," Angew. Chem., Int. Ed. 2009, 48, 1126-1129. Highlighted on inside cover ofissue. Shao, H.; Parquette, J. R.,"Structure and self-assembly of amphiphilic dendrimers in water," Mol.Recognit. Polym. 2008, 259-306. Yu, J.; RajanBabu, T. V.;Parquette, J. R., "Conformationally Driven Asymmetric Induction of aCatalytic Dendrimer," J. Am. Chem. Soc. 2008, 130, 7845-7847. Highlighted in Nature-Chemistry. King, E. D.; Tao, P.; Sanan,T. T.; Hadad, C. M.; Parquette, J. R., "Photomodulated chiral induction inhelical azobenzene oligomers," Org. Lett. 2008, 10, 1671-1674. Shao, H.; Lockman,J.W. ; Parquette, J.R. “Coupled Conformational Equilibria in β-SheetPeptide-Dendron Conjugates. “ J. Am. Chem. Soc. 2007, 127, 1184-1885.